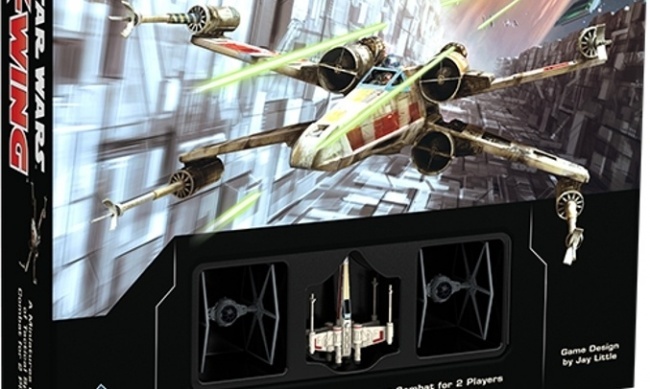 Fantasy Flight Games has announced Star Wars: X-Wing Second Edition, which will include more focus on the physical act of flying starships, refined faction identities, and the ability of players to use the Force. The new edition will premiere at Gen Con with wide release scheduled for September 13. The first releases will include the X-Wing Second Edition Core Set, Rebel Alliance Conversion Kit, Rebel Alliance Maneuver Dial Upgrade Kit, BTL-A4 Y-Wing Expansion Pack, T-65 X-Wing Expansion Pack, Galactic Empire Conversion Kit, Galactic Empire Maneuver Dial Upgrade Kit, TIE/In Fighter Expansion Pack, and TIE Advanced x1 Expansion Pack, Scum and Villainy Conversion Kit, Scum and Villainy Maneuver Dial Upgrade Kit, Slave I Expansion Pack and Fang Fighter Expansion Pack. What’s more, Wave XIV – Saw’s Renegades Expansion pack and Tie Reaper Expansion Pack releasing in Q2 will both be hybrid releases that work for 1st and 2nd edition (see “'Star Wars X-Wing' Adds Ships from 'Rogue One'”). 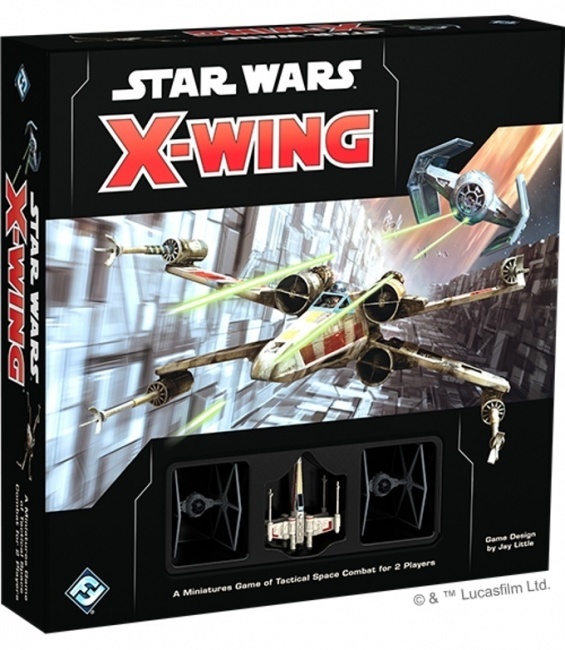 The Star Wars X-Wing Second Edition Core Set includes two TIE/In fighter miniatures and a T-65 X-wing miniature, as well as the cards, dials, maneuver templates, dice and rules needed to play. The game is for 2 -players, ages 14 and up, and plays in 30 – 45 minutes. MSRP is $39.95. 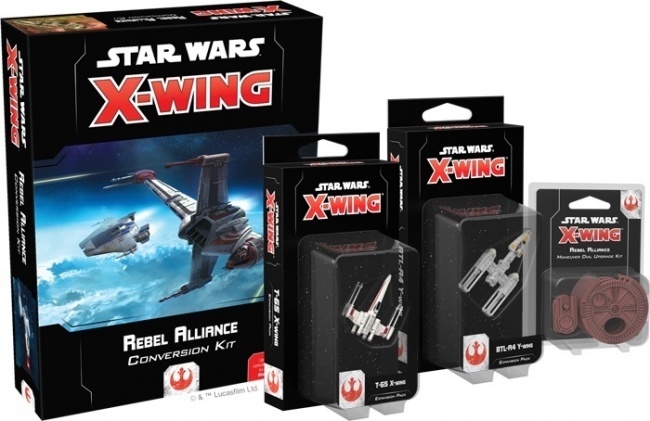 The Rebel Alliance Conversion Kit allows veteran players to upgrade their existing Rebel ship collection from the first edition of the game to the second edition. It includes second edition maneuver dials for each ship, new ship cards and tokens (including iconic pilots), and more than 100 upgrade cards to customize squads to fit different playstyles. Beyond the physical components, all the ships and upgrades in the kit will be implemented in the squad-builder app at launch. Some ships will be reclassified to the new medium-base ships. MSRP is $49.95. Please note: Pilots and ships representing the Resistance (Poe Dameron and his T-70 X-wing) will not be included in the Rebel Alliance Conversion Kit. The Resistance will join X-Wing Second Edition as a separate faction, which will have its own conversion kit in a new round of expansions. The T-65-X-Wing Expansion Pack includes a miniature, a maneuver dial, and new ship and upgrade cards. MSRP is $19.95. The BTL-A4 Y-Wing Expansion Pack contains a miniature, a maneuver dial, and new ship and upgrade cards. MSRP is $19.95. The Rebel Alliance Maneuver Dial Upgrade Kit contains three plastic protectors that situate the ship’s dials. MSRP is $9.95. 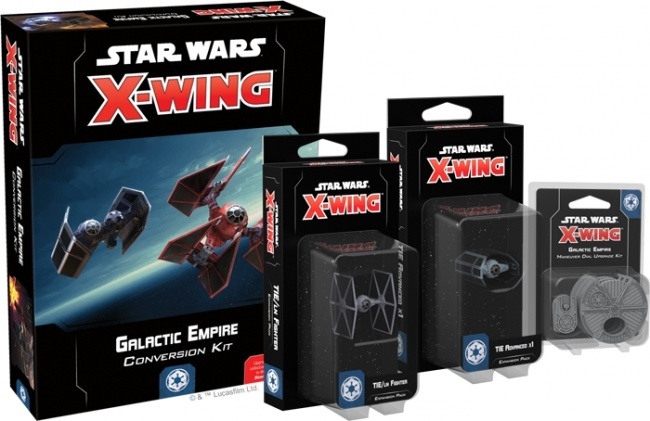 The Galactic Empire Conversion Kit includes second edition maneuver dials for each ship, new ship cards and tokens (including iconic pilots), and more than 100 upgrade cards to customize squads to fit different playstyles. MSRP is $49.95. Please note: Pilots and ships representing The First Order (Kylo Ren and his TIE silencer) will not be included in the Galactic Conversion Kit. The First Order will join X-Wing Second Edition as a separate faction, which will have its own conversion kit in a new round of expansions. The TIE/In Fighter Expansion Pack includes a miniature, a maneuver dial, and new ship and upgrade cards. MSRP is $19.95. The TIE Advanced x1 Expansion Pack contains a miniature, a maneuver dial, and new ship and upgrade cards. MSRP is $19.95. The Galactic Empire Maneuver Dial Upgrade Kit contains three plastic protectors that situate the ship’s dials. MSRP is $9.95. 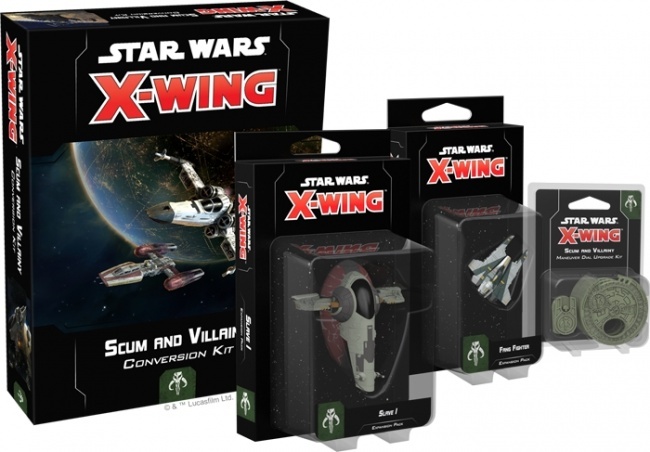 The Scum and Villainy Conversion Kit includes second edition maneuver dials for each ship, new ship cards and tokens (including iconic pilots), and more than 100 upgrade cards to customize squads to fit different playstyles. Some ships will be reclassified to the new medium-base ships. MSRP is $49.95. The Slave I Expansion Pack includes a miniature, a maneuver dial, and new ship and upgrade cards. MSRP is $29.95. The Fang Fighter Expansion Pack contains a miniature, a maneuver dial, and new ship and upgrade cards. MSRP is $19.95. The Scum and Villainy Maneuver Dial Upgrade Kit contains three plastic protectors that situate the ship’s dials. MSRP is $9.95. See images of all products in the gallery below.